Meanwhile, the Doctor’s companion Nyssa is in Rhodes during the time of the Crusades, where her position proves to be distinctly precarious. 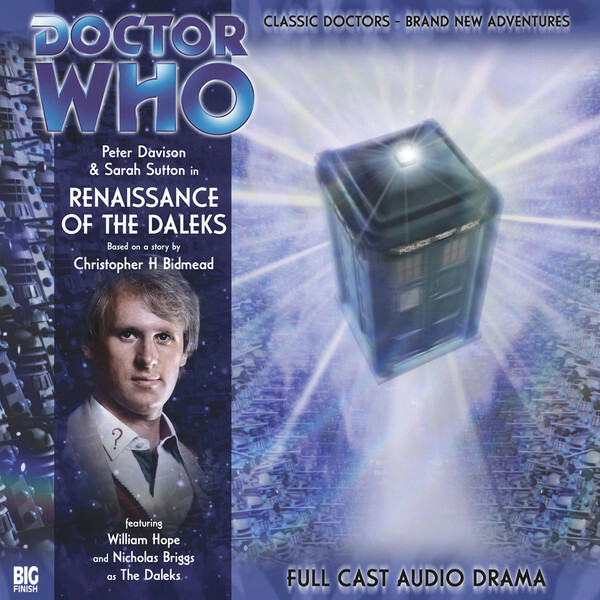 Peter Davison is the Doctor in Renaissance of the Daleks. Renaissance of the Daleks is less of a story and more of a series of individuals scenes tied together by a perfectly over-the-top and overly complicated Dalek plot. An ambitious effort gets overwhelmed by a deluge of horrible accents, characters who develop no emotional attachment with the audience, series of lulls in the action, all which overshadow a unique temporal setting and a great Peter Davison turn. Nyssa and the Doctor are attempting an experiment in trans-temporal communication. However, thanks to the Doctor’s absentmindedness, Nyssa finds herself smack dab in the middle of an invasion by the Knights of Saint John during the 14th century, while the Doctor lands on Earth in the year 2158 – one year after the Daleks’ invasion and subjegation of the planet! Well, it’s nice to read a review of this story that highlights some of the more positive aspects of the release. Reservations about the script aside, I was actually very pleased with the production of this story. Andy Hardwick brought a subtlety to his sound design that really brought the scenes to life and complimented them with some excellent music. I was also very pleased with the cast – including Regina Reagan who played the brash Alice, but nobody else seemed to like her unfortunately. The script though! And Christopher Bidmead taking his name off it. What happened there then? Well, the final version of Chris’s script was about half-an-hour too long, had twice as many characters and, to be honest, really didn’t making much sense. Nick Briggs made the only sensible decision which was to cut the script down and to eliminate or combine many of the characters. Nick did all the actual writing but much of what he did came out of many long discussions between him and myself. As well as addressing the practical issues, we wanted to make some sense out of the story. In Chris’s version there was – astonishingly – seemingly no connection between the production of the toy Daleks on Earth and the invasion being planned by the Greylish. So, a priority was to connect the two in a credible way. Also the original ending made absolutely no sense. In it, the TARDIS was broken up, in the same way that it was in [bFrontios (a story, by-the-way, that Chris had Nyssa remembering even though she had left the TARDIS by that point). The destruction of the TARDIS somehow foiled the Dalek invasion attempt, but it wasn’t at all clear how or why it had done this. So, Nick and I decided we had to create a completely new ending. After much head scratching, I came up with the idea of using the HADS to break the Daleks’ control over the TARDIS, giving the Doctor only seconds to jettison the bomb. I think there were lots of other minor changes, but these were the big ones. Despite Nick’s rewriting of the script, I would say that, apart from the climax, the story was still essentially what Chris had written – including the ‘Three blind mice’ sequence, which I really didn’t like. We sent the revised script to Chris and, as far as I remember, he read no further than the first half of episode one. Seeing that changes had been made he asked for his name to be taken off it. A disappointing reaction, especially when one learns how much he tampered with other people’s scripts when he was script editor on the TV series. The trouble with trying to repair a poor script is that you can never be entirely successful. Listeners will still criticise it and some might think that rewriting by hands other than the author’s own may have made things worse not better. I think that might be true in some instances, but not in this particular case. Even if it had been possible to produce the original Bidmead version of the script (which would have meant releasing it on three CDs and with a large cast beyond the production’s budget) I doubt many would have been happy with a story that defied all logic and had an unsatisfactory, non-sensical ending. You definitely can see Briggs and Ainsworth’s concerns throughout the story. Renaissance of the Daleks does have an interesting idea at its very core – the Daleks puling together as many temporal and time tracks into a literal Dalek City, whose foundations, streets, and buildings are composed of millions of empty Dalek shells. By turning this metropolis into a temporal hub, the Daleks are able to send whispers throughout all of time. Not only does this inspire Nyssa to build the trans-temporal communicator (“pocket interocitor”) which kickstarts the Doctor’s involvement, but the Daleks also send out voices that proclaim the spread of peace, justice, and liberty while subliminally encouraging rage, violence, brutality, and warfare. Considering this story was written and published during the much-publicized American troop surge in Iraq in late 2006/early 2007…well, I’ll just leave it at that. The master plan of the Daleks is to spread not only their mantra but their actual essence to the Earth in the form of a molecular plague that, along with the subliminal messages, will turn humanity into a willing slave race for the Daleks! And how will this plague be spread? This is the highlight of the story to me. With shades of Jubilee in mind, the Daleks have ensured that even with the threat of invasion over humanity’s head, capitalism still ensures thousands of tiny, remote control Daleks are sold to the masses, each only containing the seeds of humanity’s destruction! It’s a neat concept, played for both tensions and laughs as the TARDIS crew are chased by a tiny Dalek…until they realize it’s a tiny Dalek and simply run the other way, all the while the Dalek screaming in a miniature voice for them to come back and face extermination! There’s a good bit of The Key of Time/Keys of Marinus within this story, as the Doctor, Nyssa, and their temporary companions leap from one point in history to another in an effort to stop a much great catastrophe from happening, from the invasion of Rhodes, to the Battle of the Crater, to a helicopter assault in Vietnam. While these do give some unique moments (the TARDIS going to the wrong Petersburg in the wrong state when trying to rescue Nyssa! ), there is a good bit of “sitting around in the TARDIS and talking” that occurs in the second and third episodes based upon what happened…but the historical scenes really serve to provide an introduction to the temporary companions for this story. Sadly, these companions really aren’t much to write home about. Nicholas Deal plays a knight from Rhodes, Mulberry, who gets caught in with Nyssa in the Time Vortex and sacrifices his life to throw himself into the Time Vortex to help remove a bomb from the TARDIS. And that’s all I remember about him. Jon Weinberg is Wilton, who helps the Doctor to easily escape the General because he’s meant to help spy on the Time Lord. 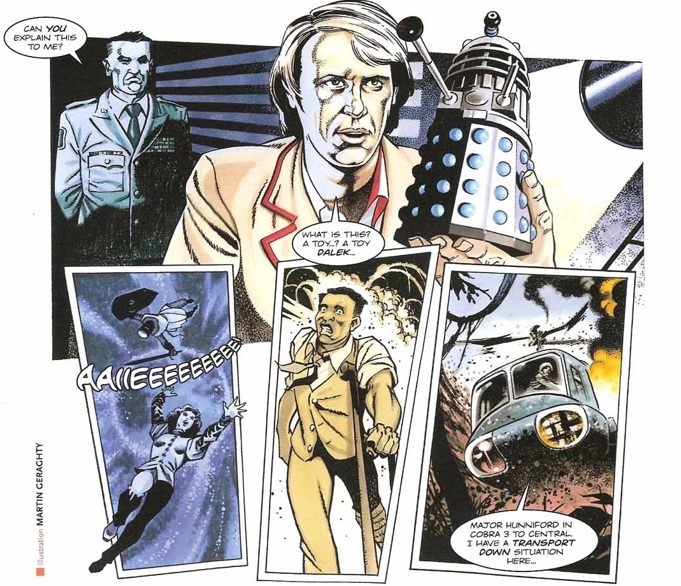 Wilton’s shows Peri-esque flashes of being a companion, specifically trying to get the Doctor’s attention while he’s distracted, but there’s not enough of a emotional stake for his final fate to really click with the listener. General Tillington himself is played by William Hope, aka Lieutenant Gorman from Aliens, and he does a wonderful job as the gung-ho, will-do-anything-to-protect Earth type without crossing over into full-blown parody. What’s kind of funny with Hope’s casting as an American general is that Nicholas Briggs stated that one of the biggest criticisms of Big Finish are the accents put on by American characters, so casting Hope was hopefully something that would appease the critics. Sadly…one, Hope is Canadian, and two, it definitely doesn’t help that the other two American characters, Floyd and Alice, still manage to fall into the “horrible accents” camp. While Sarah Sutton’s Nyssa is regulated to the stereotypical companion role of damsel-in-distress/scientific-expositioner/sounding-board-for-the-Doctor, she does a solid job with the part. And really, in a story as crowded as this one, it’s ok for the companion to take a bit of back seat as long as the Doctor steps up. Peter Davison’s performance is easily the highlight of Renaissance of the Daleks as he works at peak Fifth Doctor, the scientist who lets his curiosity get the better of him. He knows the Daleks should have invaded Earth by now that the timeline is wrong, and grouses when all these strangers keep crowding their way into the TARDIS. When the Daleks crow about how the Doctor has no choice but to follow their orders and fly the TARDIS back to Earth to spread the final and ultimate nano-invasion, his response is…to do nothing. To literally sit there and vow to wait out the Daleks. The Doctor also has faith in his companions, as shown through a “Three Blind Mice” bit that goes on a bit too long but expresses what he wants them to do without giving the game away to the Daleks. It would have been very easy to throw one’s hands up with all the behind the scenes mess, but Davison is a true professional and turns in a truly underrated performance. And of course, it’s Nicholas Briggs as the Daleks, and he’s awesome. Now, I hate being hard on a story. I can only imagine how hard is it to write, direct, produce, and act in any sort of production, especially one with rewrites and a bit of loggerheading involved. There are a lot of flaws with this story, but there is still a lot to enjoy about Renaissance of the Dalek, as the plot DOES make sense and comes together in the fourth episode, pulling all the different parts together into something workable. The sound work is quite good as usual, with the musical scores standing out as some of the best Andy Hardwick has done, specifically a bit of the poundy drums. It’s a unique Dalek plot that involves time travel and “the TARDIS going through time sideways.” In the end, I don’t think Renaissance of the Daleks is a classic story, but I can say it’s a lot better than the overall reputation it seems to get. It’s worth a listen if and when Big Finish puts it on sale, just be aware that it’s a flawed gem at best. + Tiny toy Daleks menacing our heroes! Synopsis – Better than its reputation, Renaissance of thee Daleks’s unique story and flashes of brilliance are muted by some behind-the-scenes concerns, a thin thread of an overall narrative, and horrible American accents. Colin Baker is the Doctor in…I.D. This entry was posted in Big Finish Review and tagged Big Finish, Big Finish Audio, Big Finish Review, Daleks, Doctor Who, Doctor Who Audio, Doctor Who Review, Fifth Doctor, Nyssa, Peter Davison, Sarah Sutton, TARDIS. Bookmark the permalink. I was missing your BF reviews!! I’m a big fan of Big Finish audios and my three number one reviewers are Doc Oho, Styre from audioreviews.co. uk and you, and every time I relisten to an audio I go to your pages. Looking forward your next reviews!